Only 150 of the hot Leon CUPRA R ST special editions will be available in the UK market, with ordering opening on 9 April. The 2.0 TSI 300PS will have an on-the-road price of £37,975 – but for just £500 customers can upgrade to 370PS with the addition of an ABT tuning pack. Insurance rated and with no impact on the homologation status of the car, it will reduce the 0-62mph figure to 4.5 seconds. With high specification as standard, the special edition comes with quad exhaust, Brembo brakes, bucket seats, KESSY and a panoramic sunroof. Copper accents and carbon fibre detailing add to the premium external appeal, and upgraded models will feature ABT detailing on the rear badge. Its highly tuned turbocharged, direct-injection petrol engine linked to a seven-speed DSG transmission means the Leon CUPRA R ST 300PS can hit 62 mph (100km/h) in just 4.9 seconds and reach a top speed of 155mph (250km/h). The performance is accessible and manageable thanks to the vehicle’s advanced 4Drive drive system, with an accomplished ride quality due to the specific CUPRA dynamic chassis setup. In order to improve cornering speed and handling performance, new uprights have been added to the front axle that modifies the negative camber (2º); the rear negative camber is also at 2º. Even at first glance the Leon CUPRA R ST distinguishes itself from the competition with a compelling exterior design. The newly developed lateral air intakes with copper colour treatment give a subtle indication of the vehicle’s heritage. Add to this the extensive use of carbon fibre to maximise the Leon CUPRA R ST’s performance and aesthetics – the front splitter, the new rear spoiler, the side skirts and the rear diffuser all benefit from the material – and the car’s confidence becomes increasingly apparent. The Leon CUPRA R ST’s striking exterior appearance is amplified by an arresting choice of colours: Magnetic Tech, Midnight Black, Nevada White or Blackness Grey – an exclusive exterior colour for the vehicle. Copper logos and badges also emphasise the Leon CUPRA R ST’s credentials, with the same tone used on its exclusive 19” alloy rims with copper hub caps which frame the front Brembo brakes – another hint to its overall performance. While the Leon CUPRA R ST is designed as a high-performance vehicle it also supplies the necessary levels of comfort and convenience that modern life necessitates: keyless entry and front and rear view cameras are included as standard. 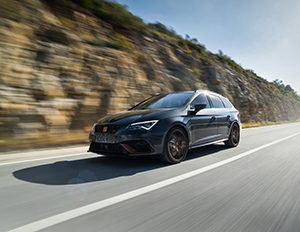 In a world that requires us to remain connected, the Leon CUPRA R ST integrates the latest connectivity suite meaning drivers can link their mobile devices to the car and benefit from selected apps and increased functionality.